Here at TDC East, we read a lot of ride reports. Many of these ride reports go on for months and even years. 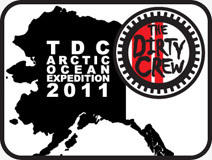 TDC East has a 12 year old, so these longer trips are just a few years out of reach. That being said, flying somewhere and renting a bike for a week or so is possible. Here are the ones that we at TDC East have our eyes on. What, Swamp Monster? You can get the time off? Sounds good, let's go! I could have the time off, but I need to make and sell many tents before I can ride, ride, ride. That doesn't mean that I can't take some time ADV-riding... all in the name of "product testing".